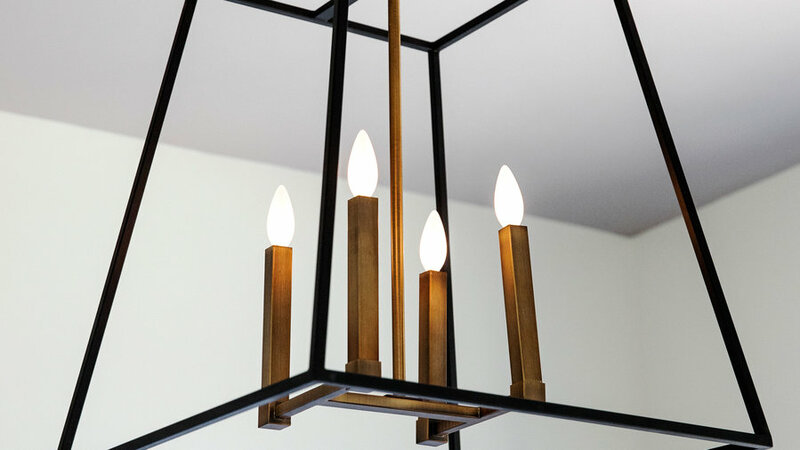 In the dining room, the team combined several pendants to create a linear chandelier. The concept sweeps the length of the table and the fixture’s minimalist features don’t obstruct views. lampsplus.com for Cove Point Open Frame Mini Pendants, $99. Powder rooms are perfect spaces to take design chances. 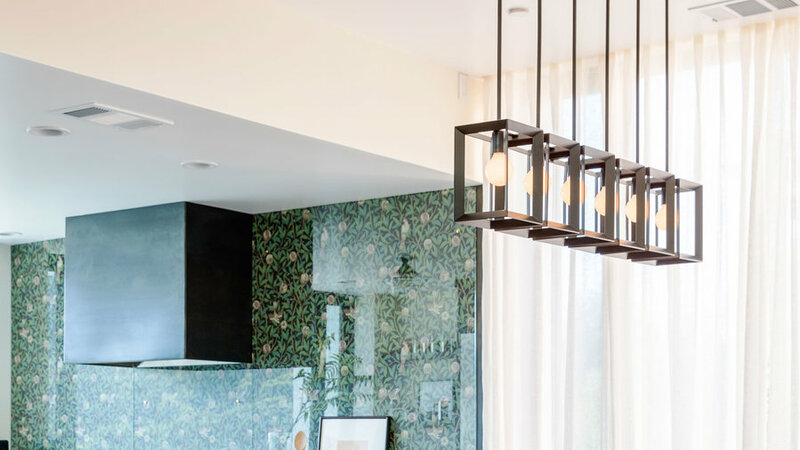 This one didn't have much natural light—so the designers ran with that, applying a dark gold-splattered wallpaper and hanging a light fixture that makes the room feel like its own glamorous galaxy. Omega Lighting Design for hanging light fixture. In the artist studio, where the ceiling stretches almost ten feet high, the designers chose a large fixture with a transparent vibe. It doesn’t obstruct the natural daylight or block the cool hint of color coming off the soft lilac-hued ceiling. 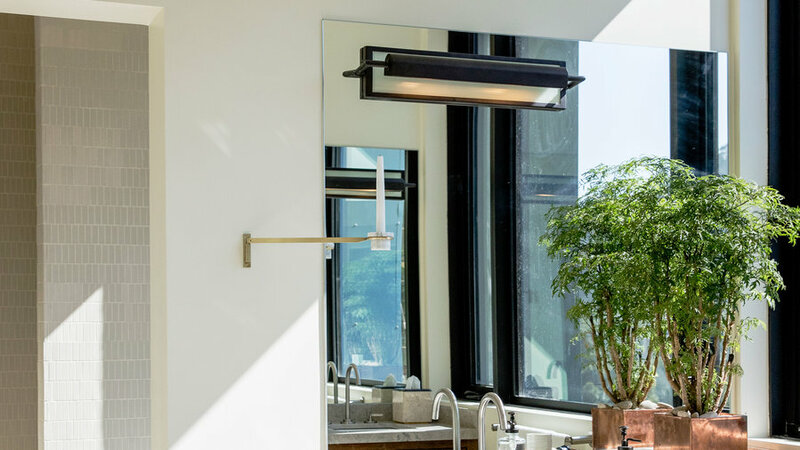 These bronze sconces (which can be hung vertically or horizontally) above a pair of back-to-back double vanities with offset sinks were placed on the mirror to create a more intimate lighting experience. lampsplus.com for Feiss Mila Collection Bronze Wall Sconces, $205. 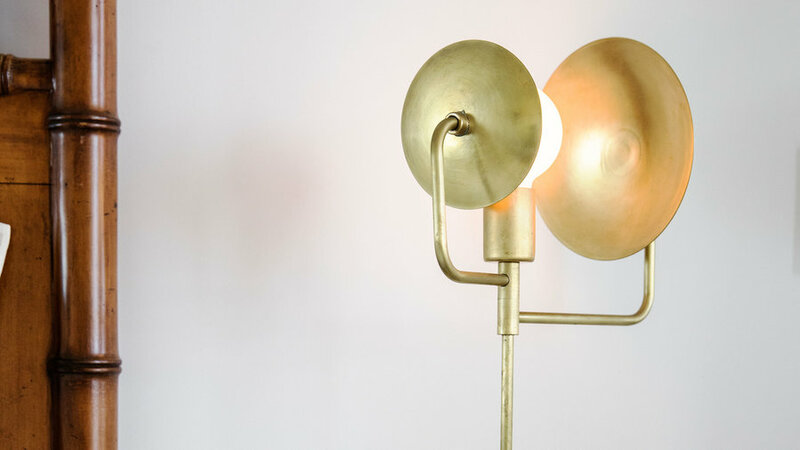 In the guest room, a tall, sculptural brass and marble lamp breaks from the traditional bedside lighting mold. 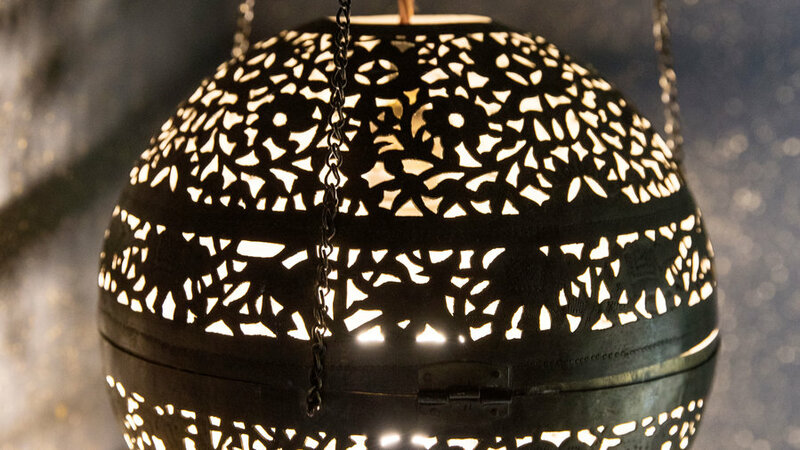 The fixture features a twisty, sconce-like feel whose texture and warmth pairs well with the bed frame’s dark wood. thefurtureperfect.com for Orbit Table Lamp, from $1,350. 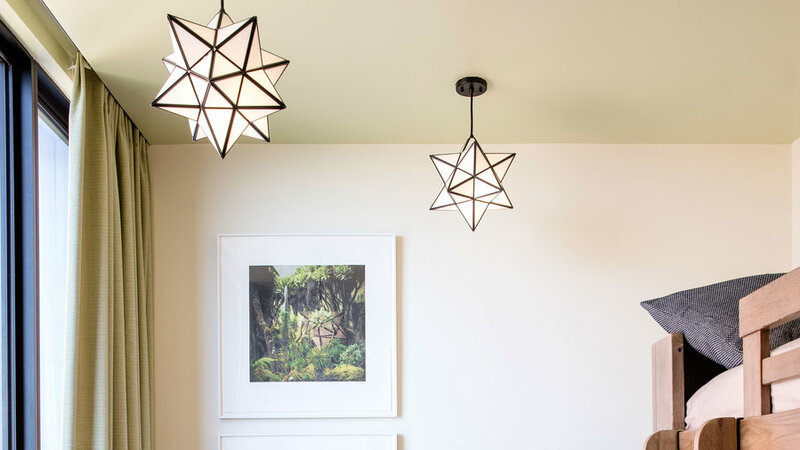 In the kids' room, the designers hung three identical milky glass star pendants at different heights around the room to create a whimsical constellation effect. lampsplus.com for Cuthbert White Glass Black Iron Star Pendants, $179. 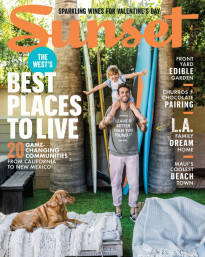 The designers created a materials and color palette that continues subtly throughout the house. 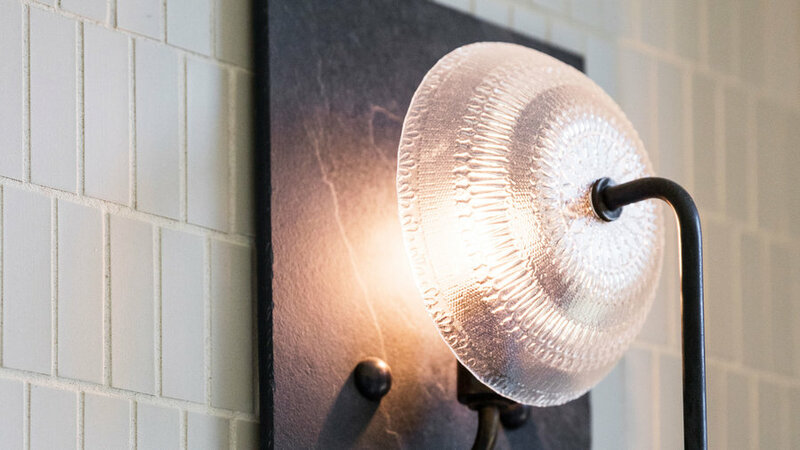 These sconces in the master bathroom, for example, were fabricated from vintage light fixtures but also in part from the new slate tiles used on the floor of the children’s bathroom. omegalightingdesign.com for custom lighting fixture.